I was unsure of the direction I wanted to take. Several things had to be taken into consideration. Our staircase now opens up into our new dining room. So, the runner needs to look good in this room but also look good from the upstairs hall. I want it to look like a real runner. I love this look but know it would not work well in our home! I need to be able to mop it! If I use a vintage feedsack for inspiration...I didn't want to paint the faux feedsack in a color palette that was not actually available. So, I went looking and found this one. It would need to be something I could live with....for a very long time! So, I went to Pinterest for some inspiration! I was open to new ideas and found some really great inspiration! 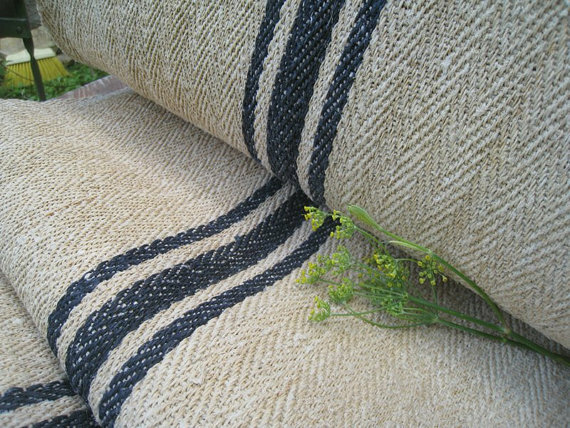 This one was great but I felt like the center band was too wide for our narrow staircase..
Then I found this one...and thought it best suited our home and our lifestyle. It also incorporated the grain sacks that I was wanting to bring into this room. So I began painting but got distracted this past week by a dozen other projects! I am almost there though! I decided to make ours look just like the real deal I had found on etsy. I loved the indigo color and it will work well with so many things! The dining room is nearly complete...I finished painting all of the wood work and even hung the platters on the wall this week. I also like the idea of panels in the dining room! I could even mix it up a little! Panels in the dining room and a roman shade in the kitchen! Because the dining room has the full blast of sunlight from the south most of the day...I think maybe even both in the dining room! If you have any advise..would love for you to share! I am open to fresh ideas! Well, I must get back to painting! Have a wonderful rest of the week! 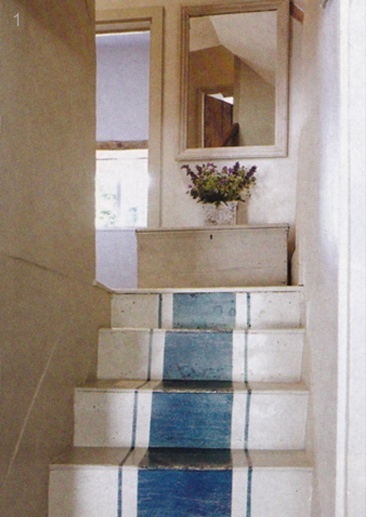 oh Donna, I love the staircase "runner"! so many gorgeous ideas and lovin' your beautiful new dining room! Your staircase looks beautiful! I would love to do that.But we don't have real wood.I think it is more like plywood. It is really looking so beautiful. I think if you have a lot of sun in the DR, maybe you should do both, the roman blind and the panels....this coming from one who lives with constant sun!! 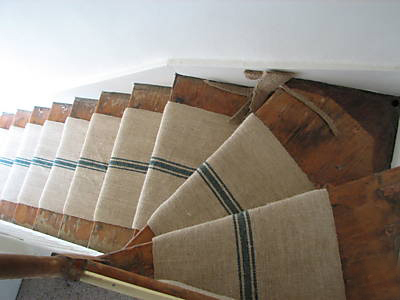 Just adore the grain sack look runner idea on your steps. 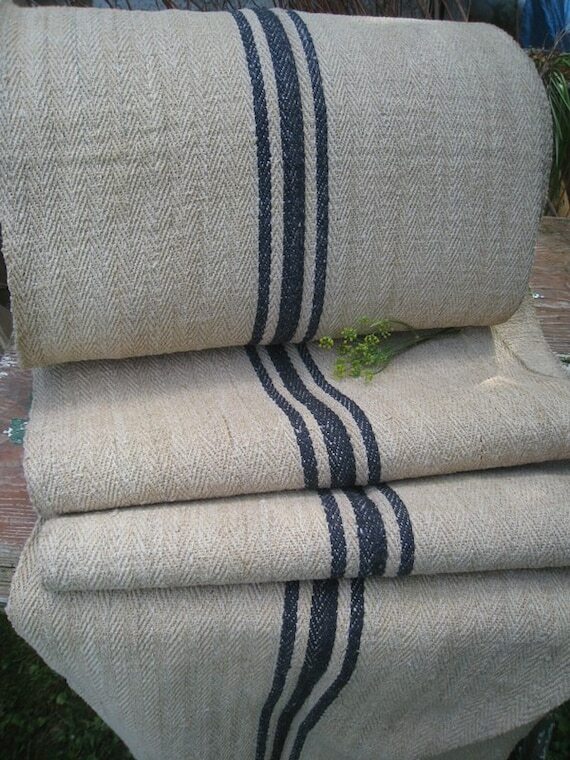 I love the grain sack idea, it looks fantastic, and I am very impressed with your painting talents. And the entire dining room is gorgeous! I love Roman shades; the linen with grosgrain ribbon trim looks nice. I love the steps! They look amazing! I see you've added a bench to dinning room as well! I love it all! I'm excited to know you will be getting cabinets soon to! Donna, your staircase looks amazing! I LOVE the runner! You do such a beautiful job in anything you do my sweet friend. Your dining room is gorgeous. Things are looking beautiful at your house!!!! This is such understated elegance and I see it as timeless. You are very creative and do such beautiful work. Your home is classic lovely. Wow I loved the staircase Donna!! Its so fabulous! I actually have not seen a lot of stuff in your dining room!! It looks wonderful, but I am not surprised whenever I visit...you have the best taste and vision and execution! Love the lighting in your dining room! Would you share more information? Oh Donna! 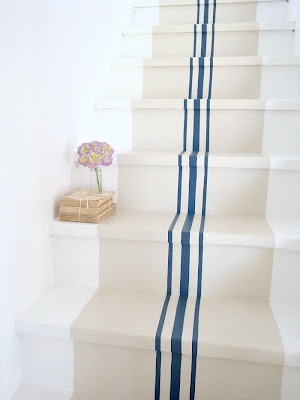 I love the painted runner on the stairs!! LOVE LOVE LOVE it! If you need custom roman shades made I can help you out with that! But I'm sure you can make your own as talented as you are with everything! Your faux runner is amazing. I remember all of your prototypes and the cutouts for this staircase. It is so wonderful to see the final product of your design process! The dining room is pure charm. You are brilliant, my friend! I will mail Lucy Bell's spritzer next week. Wow Donna, You must have a VERY steady hand - lol! It looks absolutely incredible! I remember seeing the Faded Plains version, and thinking how wonderfully creative and practical an idea it was. It looks absolutely perfect in your home too - and goes beautifully with your dining room. Your whole style, in fact is a total and utter inspiration. 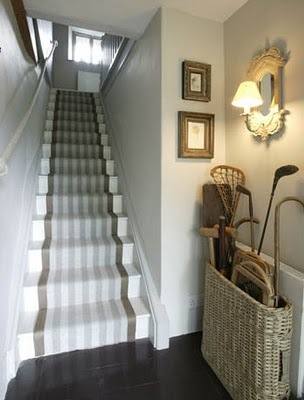 Your stairs look amazing and such a clever idea and your dining room...gorgeous!! It looks fabulous! Love your stairs. It actually looks just like the one you found in Pinterest. So pretty! Your dinning room is coming along nicely. Remodeling is HARD!!! We are in the middle of doing our Master Bath & closet. Expensive & hauling all the clothes out... YUCK! I am going through & cleaning out unused things as I put them back. That part is good. Hey Donna - Your staircase runner turned out fabulous! :) I can recall when the pass through fireplace was just being started....earlier this year. Hopefully everything will be finished, and you can enjoy it this fall.